Apple Hazelnut Blueberry Muffins. And, organization. 2015 is off to a good start. Late last year, I read Marie Kondo's bestselling book on organization after David Lebovitz mentioned it online. It's the kind of book that repeats itself for emphasis, but I didn't mind it. I took away a lot of good advice, and have taken to paring down tons of worldly possessions that aren't doing me any good and might do someone else better. Harder than getting rid of paper and toy clutter is getting rid of clothes. I HATE shopping for clothes, and really it's not a stretch to say I can't recall the last time I shopped for clothes (not counting the desperation trips to the super thrift right down the street), so I tend to packrat them even if I don't figure I'll ever wear them again. Inspired, I did get rid of some clothes but, it's harder still for me to part with t-shirts. Some upwards of 20 years old, t-shirts are my fashion life. At least most of them are now filed in an orderly fashion in my drawers, folded just one more time in half than my previous t-shirt fold has saved me tons of space in my dresser - I have room in my dresser that I never knew existed. Thank you David Lebovitz. Your power of suggestion has saved my (organizational) life. In addition to well organized sock and t-shirt drawers, I took another organized cue and started my new year with a solemn vow to make sure my kitchen is completely tidied up before going to bed. The kitchen is my domain; I spend almost my whole day in it, or the attached dining room where my son is doing his schooling work. It's a pleasant, south-facing space that has good light and is generally fairly clean. But I am of the ilk that does not dry her dishes but rather waits for them to dry. I do other things when they dry, but I do not take out a towel and dry them. I'm stubborn that way. I realized that having to empty the dish rack in the morning and then tidy the rest of the kitchen/dining area was causing me stress before our school day even began. Other things making me happy in general are muffins. Muffins are not usually something I get overly excited about - they are utilitarian and something I usually make out of necessity (even though that never stops me from trying to find really good ones). Ordinarily I'd rather make tea cakes or quick breads, anything in a loaf pan really and I'm not sure why. Muffins have a good place in a kitchen with kids, that's for sure. And having a supply of them for the inevitable snack request is just good thinking as a parent I guess. I've been enjoying the recipes in Whole Grain Mornings (Megan Gordon) for weeks now. It's a great book of breakfasty inspiration, which I kind of need in the box-cereal free environment that I've created for ourselves. We eat plenty of oatmeal and other porridge, but I don't break out of my smoothie mold easily, and I've that one particular son that is so picky. The book is arranged by season, and the winter season is where I began, making Morning Glory Oatmeal (steel cut oats, carrot, raisins, coconut, why didn't I think of that??) and Pear Hazelnut Oat Muffins. Those muffins! I first made them in my clean kitchen before bed, getting the ingredients measured (the whole book has metric weights! YES!) for quick morning assembly. I got 15 muffins instead of 12, and we ate them by the multiples. When warm, like a portable bowl of comforting oatmeal and when cool like moist slices of cake. Like any quick-bready recipe, I cut the sugar in half and didn't miss it at all. And then I started playing around with the flavors. I'm fairly certain anything you add to these muffins will be a good idea. 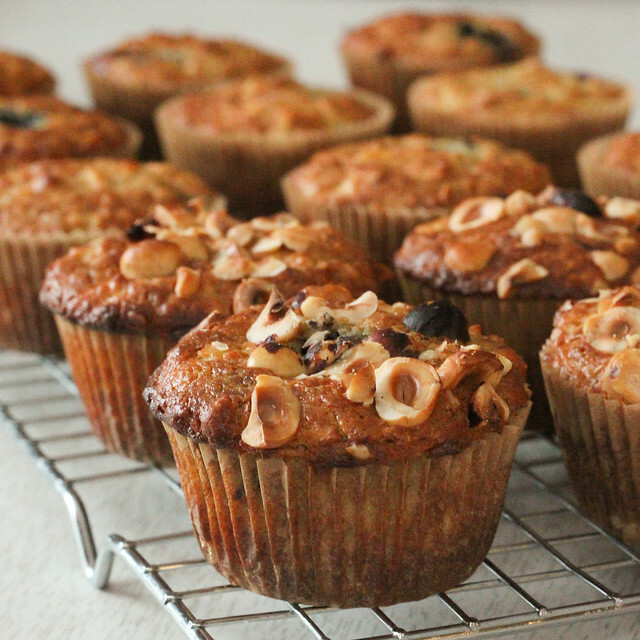 I actually only topped some of my muffins with nuts instead of baking them inside as Megan suggests. The baby likes nuts and isn't allergic, but I'm not too fussy with chopping so I then have to pick through the whole muffin as he eats it. My older boy doesn't care for hazelnuts (I know, right? More for me.) so I put them only on the top of some of them as a solution for us all. I like how they get all naturally toasted, and it's like staking a claim to as many muffins as I like. Or as many muffin tops as I like. Megan reduces the oven heat immediately after adding the muffins to the oven. I didn't do this, and in several batches the muffins were all fine. You may choose to lower to 375 after the muffins hit the oven if you want. Preheat the oven to 425, line muffin tin with liners or butter them well if you prefer. In a small bowl, combine oats, flours, baking soda, baking powder, spices and salt. Mix well to combine. Melt the butter over low heat, and shred the apple. Put the sugar in a large bowl that will become your mixing bowl. Add the butter, and stir well to combine and start to dissolve the sugar. Then, whisk in the yogurt/milk (or buttermilk), eggs, vanilla, and shredded apple. Add the dry ingredients and fold/stir it in gently. Finally fold in the blueberries. Fill the muffin tins almost to the top. 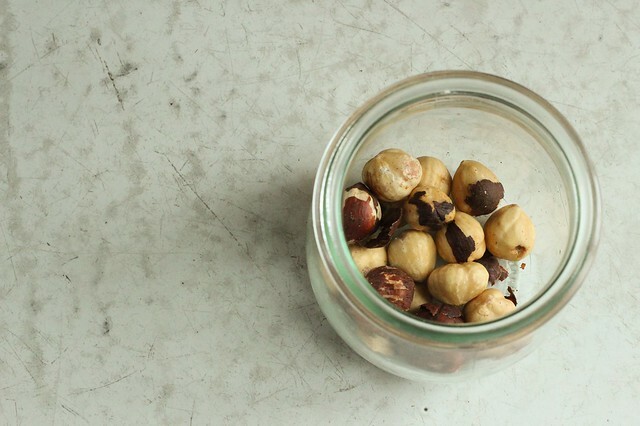 Top with coarsely chopped nuts if desired, and bake 22-25 minutes or until a tester comes out clean. Cool the muffins in the pan for 10 minutes, then remove them to a wire rack to cool completely. The texture of the muffin changes as it cools - it sets up more as it gets cooler. I've had good luck keeping them in an airtight container at room temperature up to 4 days. In a way, this recipe reminds me of Dorie Greenspan's Breakfast Bread, which includes applesauce and oats (and I also make it with half the sugar, and just a nut topping). She calls the bread "almost puddinglike" inside and these muffins, at least while warm, would remind you of that description. I would expect you could use fruit sauces instead of the shredded fruit, especially if baking by weight. I'll probably try using applesauce or pearsauce or maybe even pureed mango or something. I do know for certain that I'm not done with these muffins. Can a muffin make you more organized? I like to think so. Having that little, generally nutritious something to pop in a hungry mouth on a whim is pretty nice. I might make a point of more muffins, and maybe even stashing some in the freezer. I got away from muffin freezing because I tended not to grab them and then months would pass and I'd discard my labors. But with muffins this good, there's no need to freeze. For breakfast, snack, or even as a dessert, they have helped my year get off the ground in a very nice way. A nicely, organized way!